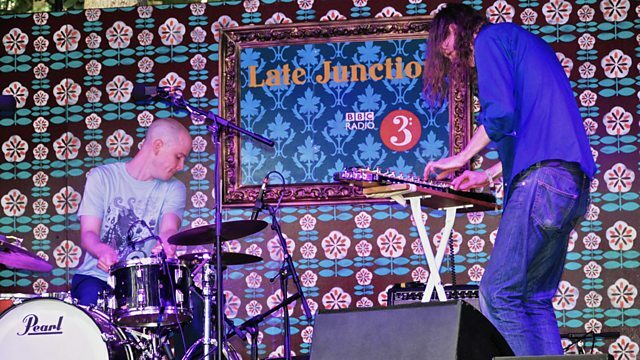 Max Reinhardt presents highlights from the Late Junction stage at the 2013 Latitude Festival with live sets from Walls vs Daphne Oram, Flower Corsano Duo and Troyka. Max Reinhardt presents highlights from the Late Junction stage in the Lavish Lounge at the 2013 Latitude Festival. On tonight's programme Walls vs. Daphne Oram bring the live incarnation of a project that has seen electronic duo Walls dig deep into the archives and transportative soundworld of the late Daphne Oram - composer, inventor and founder of the BBC Radiophonic Workshop - creating new material from the sounds they found there. There's an acutely musical collaboration between kinetic DIY drummer Chris Corsano and Mick Flower on shaahi baaja, known as Flower-Corsano Duo (pictured) for a set of free improvisation that encompasses delicacy and noise at one fell swoop. Acclaimed London based band Troyka bring a new vision of the jazz trio as their guitar, organ and drums swap roles in an ever changing musical landscape. Plus, Viriginan Matthew E. White stops by our acoustic truck to record a session of swirling gospel-folk, as does Sierra and Bianca Casady aka the mysterious Coco Rosie with a multitude of instruments. Presenter Nick Luscombe also meets one of his soul heroes in an exclusive interview with the legendary Bobby Womack.